The Australian Prime Minister has announced that the country will hold a general election on May 18th. All 151 seats in the House of Representatives and half of the seats in the Senate will be contested in the election. The current Prime Minister Scott John Morrison leads the Liberal Party into the election. His party are generally behind in the polls to the Labor Party. However Mr Morrison leads Bill Shortern (Labor) as the preferred candidate for Prime Minister in those same polls. 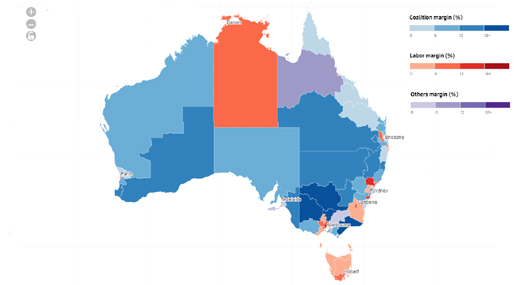 The Guardian has released an interactive map which shows the two party preferred margin in each seat in the lower House of Representatives, following the most recent redistribution. The map shows the lead held by either the Labor or Liberal party over each other in each seat at the last election. If you hover over a seat on the State of Play map you can view the actual percentage of the margin and the name of the party which currently holds the seat. The Australian Parents Council has also released an interactive map which shows the current Australian federal electorates and all the schools in each electoral seat. The map also contains links which allow you to read about each party's education policy. The APC Electoral Map colors each seat to show the political party of the sitting member. If you click on a seat on the map you can view the name of the current member, their winning margin and details about all the schools in the seat. If you click on a political party name in the map legend you will be taken to the party's education policy on their official website.